As I write this, I’m a few hours away from seeing Star Wars: The Last Jedi. Some of you are shrugging your shoulders right about now. You know what Star Wars is, of course. You’ve probably seen at least some of the movies and know something about the major characters. You may have noticed the subtle advertising campaign for the newest chapter in the series. (Plastered everywhere human eyes can see and tied into every piece of merchandise human beings might consider buying.) But you’re frankly a little tired of the hype and can’t imagine fighting opening-night crowds to go see it. You’ll catch it in a few weeks or maybe even wait until you can stream it or something. If that’s you, there’s something you’re going to want to consider: spoilers. Starting tomorrow, they’re going to be everywhere. There’s an embargo in place right now: journalists can write reviews, but only if they’re spoiler-free. Those who break this sacred rule and are caught will, I guess, not be invited back to advance screenings of future films. So spoilers are hard to find right now. But that embargo ends tonight or tomorrow with the official release of the film, and that means plot points will be up for discussion everywhere. You might see something mentioned in a review, or overhear a major twist in casual conversation. After tonight, you may find it hard to go into a showing of The Last Jedi without at least some advance knowledge of how it’s going to go. Some people don’t mind spoilers, though. I myself have been known to occasionally read the plot synopsis of a movie on Wikipedia before I see the movie, or read a film’s novelization before going to the theater. What you may give up in surprise, you get back in a larger understanding of the movie from the beginning. You know what to expect. You aren’t at the mercy of every little plot twist that puts the heroes in jeopardy. You see the bigger picture. And there’s joy instead of anxiety in watching the director, crew, and actors bring a well-told story to its conclusion, even if you already know that conclusion. I know not everyone feels that way. But I think Luke, the guy who wrote the Gospel that bears his name, might have been a fan of spoilers. He embeds them, after all, in his earliest mentions of Jesus. Take Zechariah’s prophecy in Luke 1:68-79, called by some the Benedictus (for its first word in Latin). The song is as full of spoilers as a movie reviewer with a caffeine buzz banging out a review on opening night. Zechariah begins by blessing God, praising him, for what he has already done. For context, keep in mind that his son, John the Baptist, has literally just been born. Jesus’ birth is still a few months away. There’s no cross or resurrection for three decades. Yet Zechariah begins by talking about God’s salvation as an accomplished fact. Look at the tenses of the verbs. “He has come.” “Redeemed.” “He has raised up a horn of salvation.” We westerners with our very linear ideas about time and our misunderstanding of prophecy tend to think that Zechariah is predicting salvation. But that’s not really what’s happening. He isn’t predicting as much as he is proclaiming salvation. It’s a spoiler: God is worshipped because in the coming of Christ Zechariah sees salvation. He believes that the story has been written, and everything that happens next is just going according to script. Knowing the ending and the main beats of the story completely changes the way he sees everything else. As Zechariah spoke those words, he lived under the thumb of the Roman Empire. There was a foreigner sitting on the throne of David. When he went to serve in the temple he undoubtedly passed Roman soldiers in the streets of Jerusalem. There had even been times when the Romans had marched their standards right into the temple precincts themselves. His taxes went to Rome, and his religious freedom depended largely on Roman generosity. “Salvation from [his] enemies and from the hand of all who hate [Israel]” might have seemed very far away. Yet, for Zechariah, it was coming just as sure has his son had been born, just as sure as the baby his wife’s relative was carrying was coming. He had been given the chance to see how the story goes and knowing that changed everything. It even helped him see the prophecies he had heard all his life in a different light. They were about this! Maybe a spoiler would help you this Christmas too. Maybe you know what it is to live under someone’s thumb. When you go to church, when you worship, right there with you is grief, loss, fear, bitterness, and death. Maybe you live in constant pain, or in financial turmoil, or in a broken marriage. All of that is real, and it all hurts, and it isn’t to be minimized or ignored. You’ve been waiting for God to act, to save you, to heal, forgive, restore, renew, and you’re starting to wonder if your salvation is ever coming. Well, it isn’t coming. As sure as that baby Mary was carrying all those years ago was born, your salvation has come. I know it doesn’t always feel that way, but that’s the reason the story goes like it does. The birth of Jesus is the only testimony we need that God has come to his people and redeemed them, that he’s brought salvation to us. The struggles and hardships that we live with, the darkness of the world around us, even the sin in our hearts doesn’t change the story. And whatever else we might live through, to live our lives according to that story is to receive God’s salvation. So, maybe, knowing how the story goes will help us have a larger understanding of events of our lives. 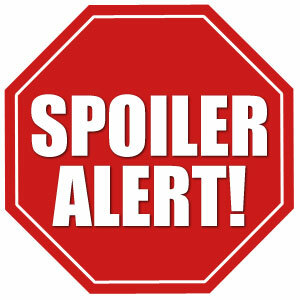 Maybe the spoiler of Christmas will help us to know what to expect. Maybe it will help us to recall that we aren’t at the mercy of every little plot twist. Maybe it will help us live by the bigger picture. And maybe it will help us find some joy instead of anxiety in watching and being a part of God weaving our stories into the larger one, and together bringing it to the conclusion that he’s had in mind since before we even existed. See? Spoilers aren’t always a bad thing.